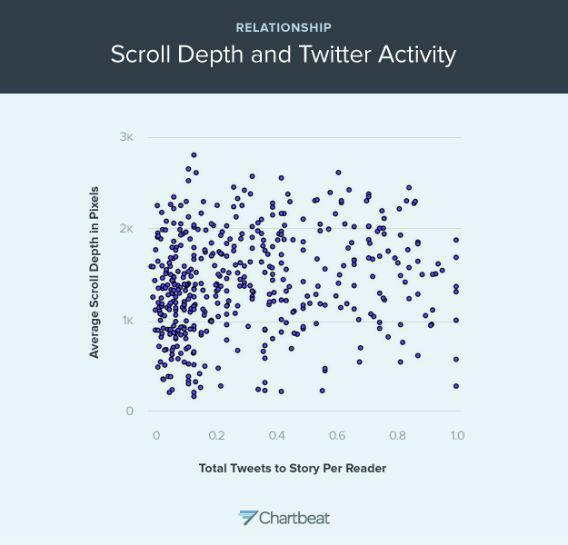 They each show the same thing: There’s a very weak relationship between scroll depth and sharing. 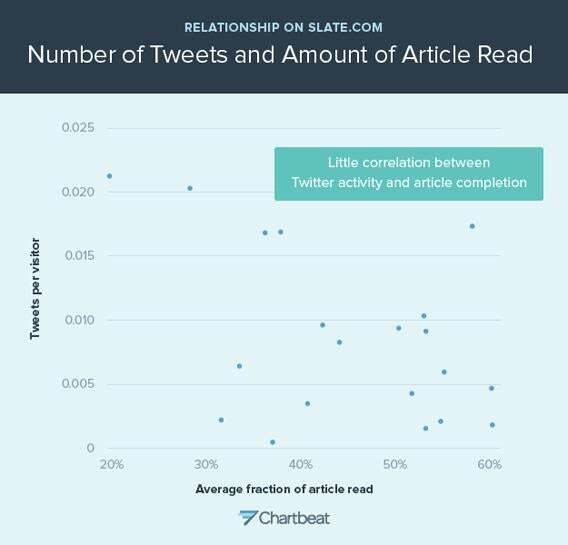 Both at Slate and across the Web, articles that get a lot of tweets don’t necessarily get read very deeply. 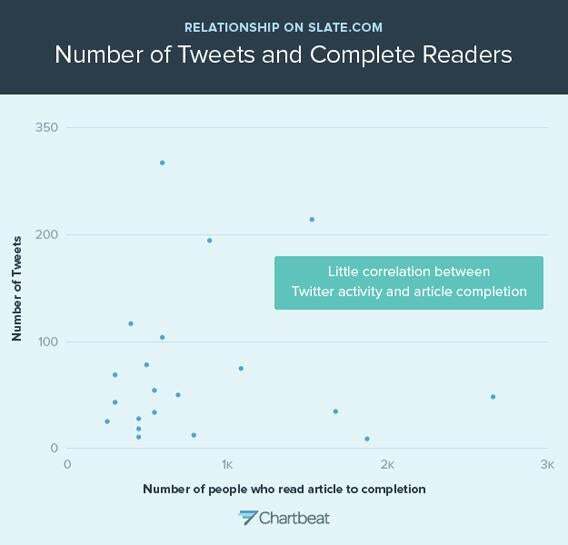 Articles that get read deeply aren’t necessarily generating a lot of tweets. But what’s the point of all that? 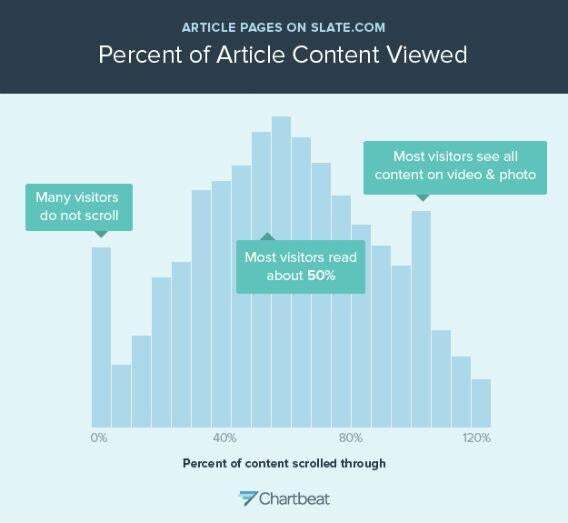 Schwartz tells me that on a typical Slate page, only 25 percent of readers make it past the 1,600th pixel of the page, and we’re way beyond that now. Sure, like every other writer on the Web, I want my articles to be widely read, which means I want you to Like and Tweet and email this piece to everyone you know. But if you had any inkling of doing that, you’d have done it already. You’d probably have done it just after reading the headline and seeing the picture at the top. Nothing I say at this point matters at all. Yay! 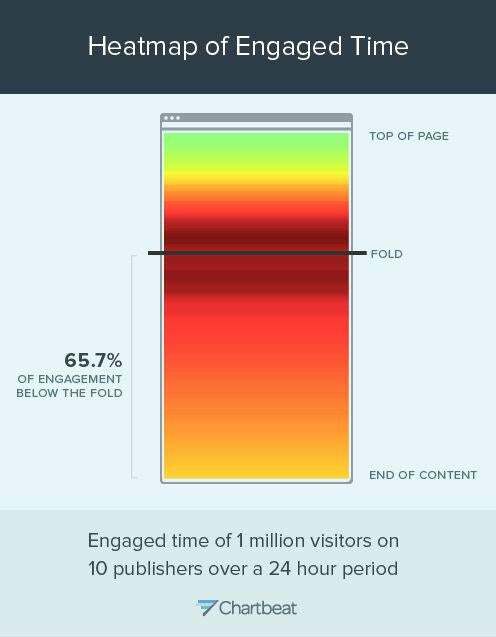 Well, there’s one big caveat: It’s probably Slate’s page design that’s boosting our number there. 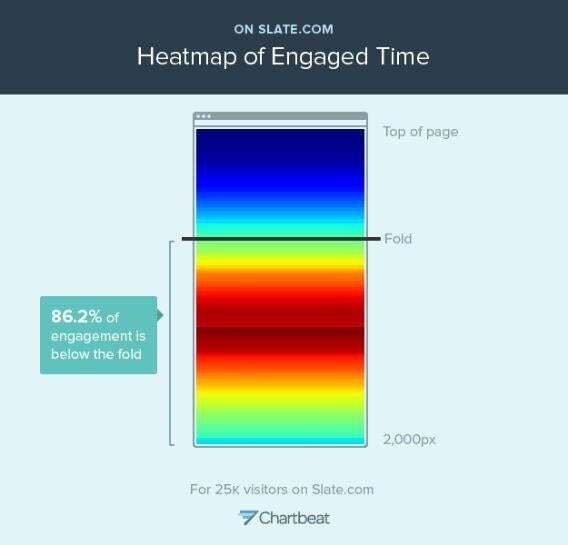 Since you usually have to scroll below the fold to see just about any part of an article, Slate’s below-the-fold engagement looks really great. 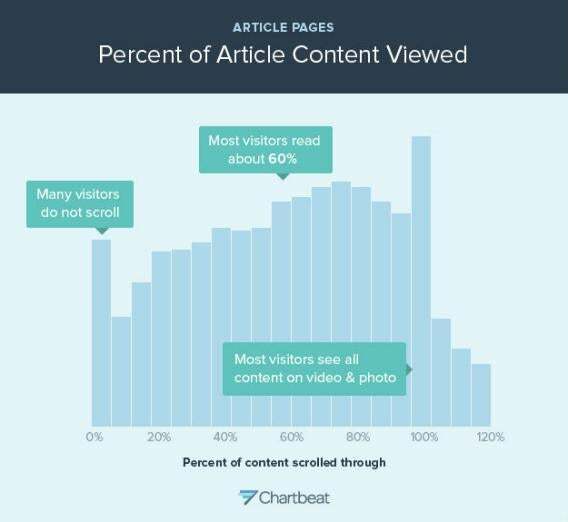 But if articles started higher up on the page, it might not look as good. Finally, while I hate to see these numbers when I consider them as a writer, as a reader I’m not surprised. I read tons of articles every day. I share dozens of links on Twitter and Facebook. But how many do I read in full? How many do I share after reading the full thing? Honestly—and I feel comfortable saying this because even mom’s stopped reading at this point—not too many. I wonder, too, if this applies to more than just the Web. With ebooks and streaming movies and TV shows, it’s easier than ever, now, to switch to something else. In the past year my wife and I have watched at least a half-dozen movies to about the 60 percent mark. There are several books on my Kindle I’ve never experienced past Chapter 2. Though I loved it and recommend it to everyone, I never did finish the British version of the teen drama Skins. Battlestar Galactica, too—bailed on it in the middle, hoping to one day jump back in. Will I? Probably not. 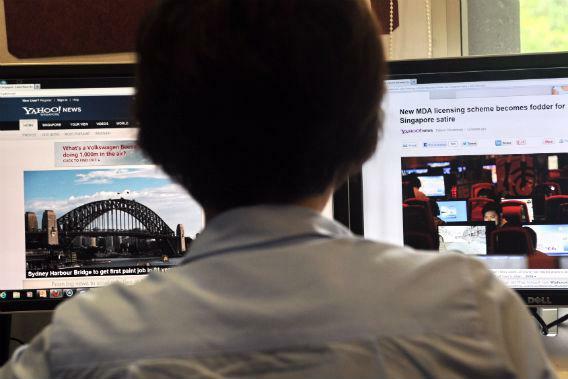 Maybe this is just our cultural lot: We live in the age of skimming. I want to finish the whole thing, I really do. I wish you would, too. Really—stop quitting! But who am I kidding. I’m busy. You’re busy. There’s always something else to read, watch, play, or eat. OK, this is where I’d come up with some clever ending. But who cares? You certainly don’t. Let’s just go with this: Kicker TK.